A key factor to accurate forecasting with exponential smoothing is the selection of the proper value of alpha (a). As stated previously, the value of alpha can vary between 0 and 1. If the actual demand appears to be relatively stable over time, then we would select a relatively small value for alpha, that is, a value closer to zero. On the other hand, if the actual demand ends to fluctuate rapidly, as in the case of a new product that is experiencing tremendous growth then we would select a relatively large value of alpha that is nearer one. Regardless of the initial value selected a will have to be adjusted periodically to ensure that is providing accurate forecasts. This is often referred to as adaptive forecasting. There are two approaches for adjusting the value of alpha. One uses various values of alpha and the other uses a tracking signal (which is discussed later in the chapter). 1. Two or more predetermined values of alpha. The amount of error between the forecast and the actual demand is measured. Depending on the degree of error different values of alpha are used. For example, if the error is large alpha is 0.8 if the error is small alpha is 0.2. 2. Computed values of alpha. 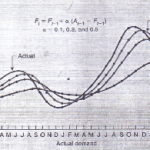 A tracking signal computes whether the forecast is keeping pace with genuine upward or downward changes in demand (as opposed to random changes). The tracking signal is defined here as the exponentially smoothed actual error divided by the exponentially smoothed absolute error. Alpha is set equal to this tracking signal and therefore changes from period to period within the possible range of 0 to 1. In logic computing alpha seems simple. In practice, however it is quite prone to error. There are three exponential equations one for the single exponentially smoothed forecast as done in the previous section of this chapter one to compute an exponentially smoothed actual error and the third to compute the exponentially smoothed absolute error Thus the user must keep three equations running in sequence for each period. Further assumptions must be made during the initial time periods until the technique has had a chance to start computing values. For example, alpha must be given a value for the first two periods until actual data are available. Also, the user must select a second smoothing constant in addition to alpha, that is used in the actual and absolute error equations. Clearly, those who use adaptive forecasting on a regular basis rely on technology for the calculations.